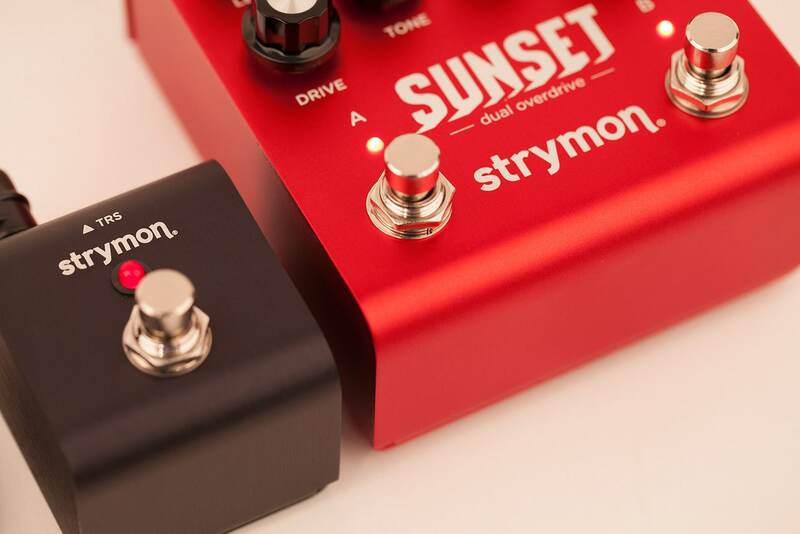 Strymon sound designer and DSP engineer Pete Celi takes you on a tour of the sounds and features of Sunset Dual Overdrive. 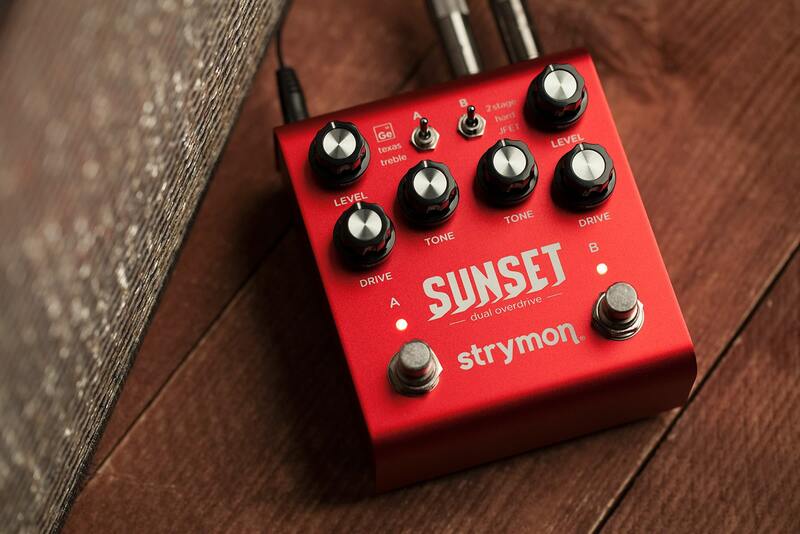 Sunset gives you the best of the best classic overdrive circuits. Audio examples performed by sound designer Pete Celi, marketing nerd Ethan Tufts, product developer Mark McCrite, and tech support guru Hugo Merida. Level controls the output volume for Channel A when engaged. Level controls the output volume for Channel B when engaged. Drive adjusts the amount of gain for Channel A. Drive adjusts the amount of gain for Channel B. Tone adjusts the treble frequencies for the selected circuit for Channel A. The character and response of the control varies with the circuit type. Tone adjusts the treble frequencies for the selected circuit for Channel B. The character and response of the control varies with the circuit type. A toggles the channel on and off. Red LED indicates that the channel is engaged. When both A and B are bypassed, an electromechanical relay is activated for true bypass. B toggles the channel on and off. Red LED indicates that the channel is engaged. When both A and B are bypassed, an electromechanical relay is activated for true bypass. In is a high impedance mono input. Plug your instrument in here. Out is a mono signal output. Connect to your amp, other pedals, mixing board, etc. Bright is a three position switch that tailors the highest frequencies of the output signal. Minus (-) smooths the top end to work well with many amps or speakers that have a brighter voice. Neutral (center) provides a balanced top end that works with a variety of amps and speakers. Plus (+) delivers extended high end detail to the warmest amps. Config selects the effect order for the two sides of Sunset. Selecting A+B places the effects in parallel. Connect an external switch to remotely toggle between the current settings and a saved Favorite setting. Expression Pedal Input provides continuous expression pedal control over any or all of the knobs, in any direction, with your foot. Or can be used in Volume Mode to control the volume level of the effect. Plug your power supply in here. Maximum 9 volts DC center-negative, with a minimum of 250mA of current. Standard 5.5mm x 2.1mm barrel connection. Optional variable-threshold Noise Reduction tames hum, buzz, and system noise when you're not playing. A downward expander with advanced signal detection techniques creates a seamless transition to noise reduced silence with all types of input signal dynamics. Press and hold B footswitch to enter Secondary Function mode. Release the footswitch, then turn the Channel A Level knob to adjust the Noise Reduction threshold. 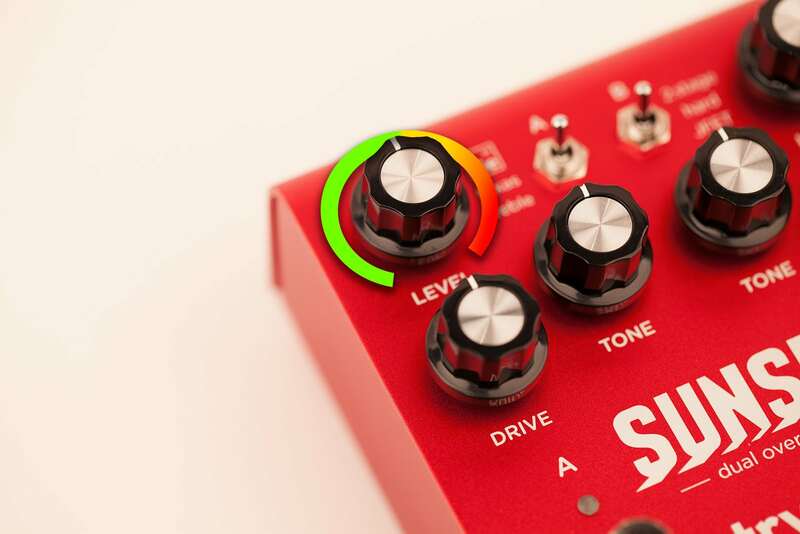 Sunset’s three-position Config switch gives you powerful control over signal flow when you stack two drive circuits. You can run whichever two drive circuits you choose in series, reverse series, or parallel, all with the flip of a switch and no recabling. Coming up with great sounding drive and signal flow combinations is fast and easy. Custom voiced for any amp. Sunset’s three-position Bright switch is custom voiced to perfectly tailor the highest frequencies of your output signal. Minus (-) smooths the top end to work well with amps or speakers that have a brighter voice. Neutral (center) provides a balanced top end that works with a variety of amps and speakers. Plus (+) delivers extended high end detail to the warmest amps. Sunset has an optional, variable-threshold noise reduction feature to tame hum, buzz, and system noise when you’re not playing. A downward expander with advanced signal detection techniques creates a seamless transition to noise reduced silence with all types of input signal dynamics, including staccato bursts and slowly decaying sustained notes. Sunset allows you to save and recall your favorite settings. Just connect an optional MiniSwitch or other external latching footswitch with a TRS cable to store and recall your Favorite setting. 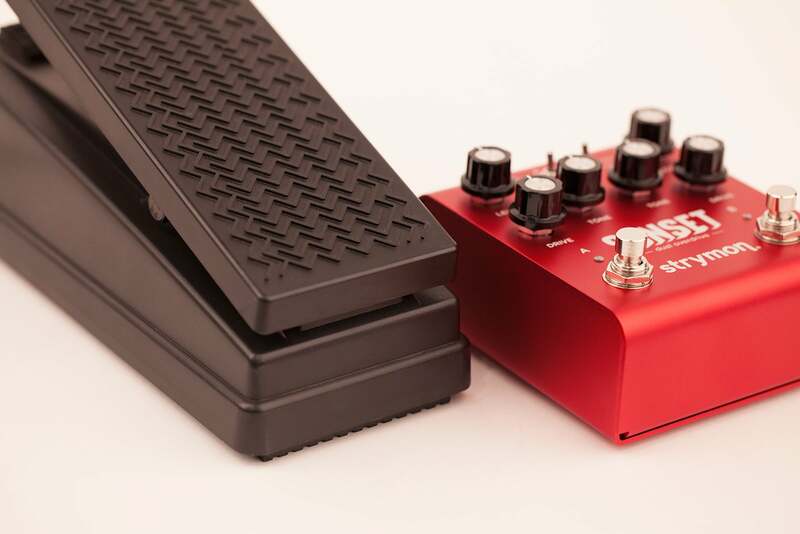 Connect an expression pedal, and enjoy a whole new level of instantaneous, continuous control. Set as many knobs as you like for the heel position and toe position of your expression pedal, and all settings will simultaneously morph throughout the full range of the expression pedal. Sunset becomes part of your musical instrument, an extension of your musical voice, an active part of your performance. The Expression pedal jack can be set up in Volume Mode, which provides a logarithmic taper for smooth volume control, even when Sunset is in bypass mode. If you have an expression pedal, this provides an excellent alternative to a standalone Volume pedal.